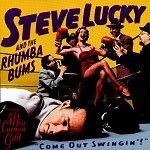 In Music We Trust - Steve Lucky and the Rhumba Bums: Come Out Swingin! Led by the jumping swing-blues piano of Steve Lucky, Steve Lucky and the Rhumba Bums are one of the few neo-swing acts to re-invent the genre while also staying true to the past. With a warm, loving sound that could pass as authentic in the time period when swing was first seeing popularity, they manage to also keep a sense of vital modern life flowing through their music. Teaming up with Miss Carmen Getit, the chemistry is hot enough to melt metal, which brings the excitement level that much higher. An amazing duo, with talented musicians backing them up, these cats are the real deal. Putting a jump in your step, "Jumptown" is all about bouncy swing beats, having fun, and dancing until the night turns to day. With a rough, but gentle, demeanor to his voice, Steve Lucky is able to lead the band through some tight arrangements that are all too enticing. Also making an appearance is Miss Carmen Getit's lovely voice, which helps play along with the beautiful tone of music, making for a romantic mixture of voices, horns, guitar, and an amazing rhythm section. Keeping a fast, vigorous pace to the music, the boogie-woogie of "Rumpus Room Honeymoon" will keep you going until you can't wail any more. The horns never give up, constantly blowing through the song, while the rhythm section serves up some beats that will get your fingers tappin' and your feet moving. Heck, as I write this and listen to the song, I can't help but pause for a minute and snap my fingers along with the music. Just so bouncy and full of life, you can't help but wrap yourself in the music and fall in love. A bit of humor never hurts, as you'll find out on "Where's My Gravy." The first time I heard this I couldn't help but crack up laughing. Who writes a song about their cravings for greasy gravy? I still laugh hearing the song, because I imagine it playing on some scratchy, black & white TV advertising a gravy brand of the past. But, the blues and jazz stripped number will get your fingers tappin' and your eyes focused on your loved one, all while a smile creeps up on your face as you hear the words "Good, good gravy is all I need." Leading the way on "Ain't Gonna Quit Ya" is Miss Carmen Getit. This jazz/swing number is quite steamy, and with the addition of her lovely voice it'll make you almost want to faint. Very organic, the song feels like a bunch of talented players got together and just jammed while Miss Carmen Getit took the mic and spilled out her heart. Finishing off with an instrumental jam, the band once again captures the energy of an improv number on "Hoppty-Do." So lively and full of energy, it doesn't feel like a studio track. It makes you feel as if you're there, listening and observing as a bunch of musicians just take you away for an hour. This has probably been said, and I acknowledge I'm not the first to say it, but listening to these cats makes you feel 'lucky.' Man, do they swing. With nearly fifty minutes of music, you'll have no problem just popping in this disc and having a blast from start to finish. There's so much craziness in the world, why not take a load off and treat yourself to something as beautifully composed as this. I'll give it an A+.